German legend brings magic to the Christmas Eve landscape. On this holiday, according to various websites, rivers turn to wine, animals speak to each other and the mountains open to reveal precious gems. Even in the depths of a wintry day, blossoms on the trees are filled with fruit. There is one condition: only the pure of heart can be a part of this magic. Whatever your holiday traditions may be, they are more than likely linked with particular recipes, the German culture being no exception. Much traditional German holiday food has been borrowed by the rest of us. Christmas goose, stollen, mulled wine and star-shaped cinnamon cookies are a few German holiday treats that have graced my table in Christmas celebrations. I’ve been a part of many German Christmas celebrations in Ann Arbor, and one favorite dish, rouladen, was always the centerpiece. There are many nuances to the preparation of rouladen, but there are commonalities to most recipes. The cook spreads thin slices of beef with mustard and horseradish, arranges onions, bacon and pickle over them, rolls them, then braises the rolls in broth or wine until they are very tender. A gravy is made with the pan drippings. It’s a personal preference, but when using wine as a braising liquid, I omit the pickle, as in this recipe. If braising the beef rolls with stock, I center dill pickle spears in the roll with the bacon and onion. According to wikipedia, traditionally the pan was covered and placed on a raised iron mount in front of an open fireplace for the slow roasting period. 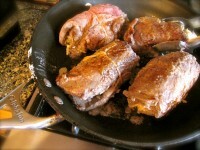 Today most cooks braise the beef rolls, covered, on top of the stove or in the oven. 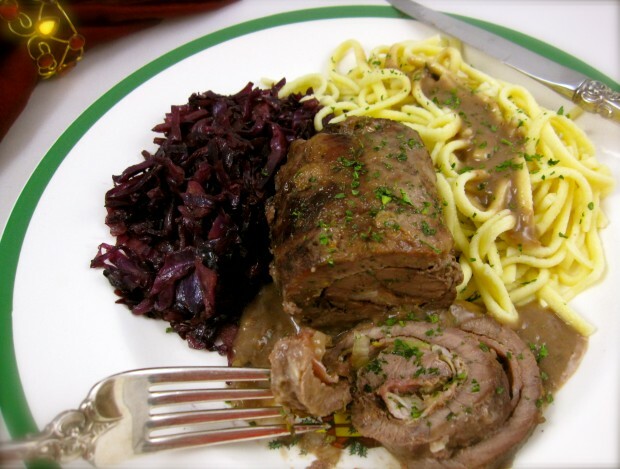 I enjoy serving rouladen with sauteéd purple cabbage and spaetzle, traditional German egg noodles that are particularly suited for soaking up gravy. As I write these words, my heart is pure. On Christmas Eve, as the legend promises, I will be able to ladle wine for the Christmas table from the Huron River and pick apples for my stuffing from a tree down the street. If my heart is not as pure as I imagine, there’s always rouladen. Combine mustard and horseradish. Divide and spread mixture thinly over one side of each beef slice. Place one slice of bacon across each. 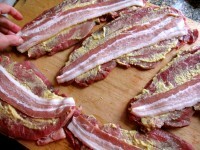 Trim bacon if necessary so it does not extend beyond edges of beef. Sprinkle with leeks or onion. Season with freshly ground pepper. Tightly roll and secure with kitchen twine in one or two places on roll. Dredge beef rolls in flour. In a heavy-bottomed sauté pan, heat oil over medium-high heat until hot but not smoking. Working in batches, brown rolls on all sides, turning with tongs as required. Place browned rolls in baking dish large enough to accommodate 8 rolls. Deglaze pan with red wine and whisk to remove browned pieces from bottom and edges of pan. Reduce wine over high heat a minute then reduce heat to low. Make a sauce by whisking 3 tablespoons of the flour into the wine and pan drippings. Slowly whisk in stock taking care not to let lumps form. Simmer, whisking occasionally, until thickened and stir in garlic and herbs. Season to taste with kosher salt and freshly ground pepper. Remove beef from gravy and tent with foil. If gravy is too thin, pour into a medium-sized sauce pan and slowly whisk in 1 tablespoon of flour. Whisking constantly, cook over medium heat until thickened. *Call your favorite butcher in advance to have him cut the beef in slices for you.